“Royal Energy Ltd.” located in Mumbai, our sister concern was founded in July 2003 and is dedicated towards developing more Green Energy and its business strategy includes raw material sourcing, production technology, marketing and distribution. 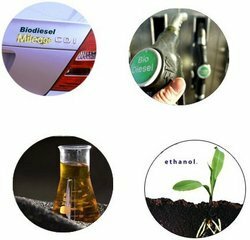 Our team of Royal Energy Ltd. has been conducting research in the domain of manufacturing of Biodiesel. The REL team has also employed a highly experienced team of 150 years in its management. Our organization contributes mainly towards the common cause of world to minimize green house effect, global warming and pollution and while doing this our sister concern has developed largest ethanol and Bio-diesel plants in India which have a capacity to hold 150 TDP and 500 TDP respectively. REL has done this mainly with a vision of becoming global market leader. Our organization is promoted by Mr.Vishesh Agarwal who is the director of our company and has done his graduation in Business Science from Babson College, Botson, USA. In 2004 he had set an ethanol plant which is one of the largest ethanol plants in India and holds a capacity of 150 KL per day. Day-to-day operations of the plant are also managed by him. He also holds a good knowledge of the alternative fuels and a good understanding of the technology involved in setting up a biodiesel plant which makes him the right person for setting up the ideal plant. His deep knowledge and understanding of the petroleum industry also proves beneficial for our organization. A notification for the mixing of ethanol to petrol up to the extent of 5% has been issued by the govt. of India (ministry of Petroleum) to increase it to 10% in the second phase in the entire country. Alcohol has become a vital raw material for the formulation of a variety of chemicals and has the potential in the form of fuel as a power alcohol. It is mainly used for blending with petrol in a ratio of 20:80 and has achieved a very important place in developing the country's economy. Alcohol has become a source of large revenues because of the excise duty which is levied by State Govt. on Alcoholic Liquors. ""In 1980s we expanded our business and started focusing on a few other areas. Our group company New Era Fabrics Ltd. which is located at Matunga in Mumbai was engaged in weaving,dyeing and printing of fabrics but because of high valuation of real estate it had to stop the functioning of the company and gave the company space on lease so as to earn revenues. Our other company Johnson Dye Works Ltd. is a real state company which is located in Mumbai.